NHS East Riding of Yorkshire and East Riding of Yorkshire Council have worked in partnership with local groups of older people to produce The Falls DVD on falls prevention and home based activity. The DVD includes a range of exercises especially designed for people at greater risk of falls. Falls are the most common cause of injury in older people and the most common reason for hospital attendance, and background research shows that the home is the most likely place for falls. This DVD was developed by older people, for older people and can be played at day centers and lunch clubs, at GP and dental surgeries, residential and sheltered housing complexes as well as in the home. 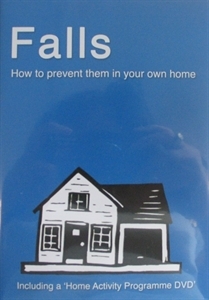 The first “Falls – How to prevent them in your own home” DVD helps you to think about you and your own house and offers simple measures to making your home safe and to prevent falls. The DVD includes a list of useful contacts and a list of aids that can assist you. The second “Home Activity Programme” DVD includes an exercise overview giving advice on how to do each exercise safely. The exercise programme demonstrates each exercise clearly and the individual exercises has written descriptions of each exercise and what the aim of the exercise is. Please note VAT is applicable on this product.